Set the oven to 200C/Gas 6. Mix the haggis with the whisky until is easy to spread. 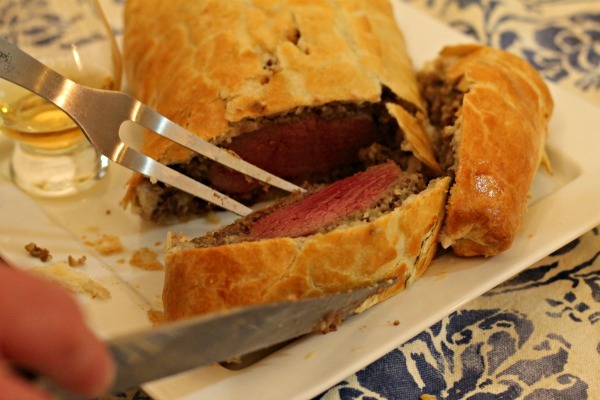 Roll the pastry out so that is about 2½ times the width of the venison and slightly longer at both ends. Place the haggis on the pastry and spread evenly, avoiding the edges. Place the venison in the middle of the pastry and fold over the two sides to meet, using a little of the egg as ‘glue’. Then fold over the ends and do the same. Place with the joined side down on a pre-greased baking tray and place in the oven for 30-35 minutes until golden brown. Remove the cooked venison from the oven and leave to rest for 10 minutes to let the juices soak back into the meat. While the venison cooks, make the clapshot. Boil the potatoes, turnip and onion together in salted water until tender, around 15-20 minutes. Mash with the butter and serve alongside the carved venison with a dram of whisky.